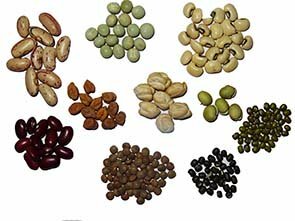 The term legumes refers to the plants whose fruit is enclosed in a pod and to the family these plants belong to (Leguminaceae). Legumes nutrition, after cereal grains, plays an important role and overall health and wellness. Being an important plant source of protein, legumes provide vital building blocks in the growth and development. They meet the protein requirement of vegetarians. Legumes represent a vast family of plants including more than 500 genera and more than 10,000 species. Legumes are the fruit pod of a plant originally from Central and South America. The word bean refers to the fruit, the seed and the plant that produces them. The pods of most beans varieties can be eaten fresh if gathered before reaching maturity. Once mature, they are no longer edible raw; the beans are shelled and the seeds called "pulses," can be used dried, and cooked. Fresh, tender bean pods can be green, yellow or purple: They used much like vegetables. Some tender bean pods can be eaten as a whole like snap peas, yardlong beans, winged bean etc. Many kinds, however, necessitates shelling of beans and discarding outer husk. They come in variety of shapes. They can be long and narrow, flat, broad, straight, to slightly curvy. While majority of beans are stinged; some varieties are stringless, such as snap peas. Legumes including beans, peas, and lentils or pulses are moderately high in total calories. Legumes are only natural sources wherein calorie composition is proportionately distributed in the healthy range of 70%, 20%, and 10% between carbohydrates, proteins and fats respectively. The protein levels in the beans range from 17% to 40%. Soybeans have highest percentage of protein among legumes. The protein profile of beans and pulses composed of all the required essential amino acids including leucine which are otherwise deficient in the cereal grains. Beans and lentils do not contain cholesterol. Their fat composition mainly comprises of poly-unsaturated fatty acids (PUFA) and less of saturated fats which help in weight reduction and blood pressure control. Their outer peel (seed coat) is the source of dietary fiber in the beans/lentils. This non-starch polysaccharide inhibits absorption of cholesterol, fats and helps in the slower absorption of glucose into blood. Pulses compose structurally complex carbohydrates, consisting of more long linear chain amylose than amylopectin. Amylose crystallizes more rapidly than amylopectin , and therefore, high-amylose starch is more resistant to digestion. Further, pulses starch composition is a type-1 indigestible resistant starch. Pulses, thus, helps in better regulation of blood glucose levels and improve insulin sensitivity even in diabetics. Some beans like kidney beans are one of the highest valued antioxidant sources. Polyphenolic pigment compounds such as quercetin present abundantly in them. Research trials found that regular consumption of high fiber, low salt and low saturated fat diet has been shown to bring reductions in blood pressure and cardiovascular diseases, and stroke. Legumes supply sulfur containing amino acids such as cystiene and taurine. Cystiene in the lentils helps in the healthy growth of hairs and nails. Germinated legumes contain vitamin-C. Germination also favors bio-availability (absorption) of other vitamins and minerals. They indeed are excellent sources of B-complex vitamins such as pyridoxine, riboflavin, pantothenic acid, niacin and folates. Fresh tender beans indeed very rich in folates. Legumes are natural low sodium foods. On the other hand, they comprise good amounts of potassium and magnesium. Both potassium and magnesium are heart-friendly minerals which counter pressing-effects of sodium and help regulate blood pressure. Additionally, they carry other minerals in sufficient amounts such as calcium, manganese, zinc, iron and selenium. Choose firm, crisp fresh beans, with a bright green or golden yellow color, without bruises or brown spots and regular in shape. A little moisture when snapped indicates freshness. Avoid beans that are overripe or too old, as they will be hard and unappetizing. While buying dry beans, look for wholesome healthy produce. Check for hardness, and buy completely dried beans that send out metallic sound when jiggled in hand. Place fresh unwashed beans 2-3 days in a loosely closed or perforated plastic bag in the refrigerator. Dry beans can be placed inside a glass/metallic container and kept away from direct sunlight, moisture and humidity. Wash fresh beans just before using; break off each end and remove the string-if necessary. Most dried legumes must be soaked before cooking. Soaking rehydrates dried legumes, reduces their cooking time and preserves their vitamins and minerals. Some legumes do not require soaking. Legumes are generally soaked for 6-8 hours, but this soaking time can be shortened or omitted if used a pressure cooker. Discard damaged beans and any foreign matter. Wash dried legumes several times in cold water and leave to soak. Discard any impurities or beans that float to the surface. Place the dried legumes in a large bowl, cover with three parts of water to one part of legumes and let soak overnight in a cold place or in the fridge. Quick soaking: Place in 3-4 cups water for 1 cup of dry legumes, and then bring gently to boil. Let simmer for 2 min cover and remove from heat. Let rest for 1 2 hr, until the beans have swollen in size. Drain and cook according to the recipes. If using microwave oven, place dried legumes in a dish large enough to contain them when they swell. Cover with cold water and cook on the highest setting for 8-10 min or until they boil. Continue to boil for 2 min then let rest for 1 hr. Cooking on the stovetop is suitable method if legumes are cooked with other ingredients, as they will absorb all of the flavors. Cover dried legumes with cold water bring to boil reduce heat and let summer for about 2 he until the legumes are tender. This method of cooking is quicker but is best when there are not many cooking ingredients and seasonings added at the end of cooking. Pressure cooking involves certain risks, especially for dried legumes that produce higher amounts of scum, such as soybeans, lima beans and various different peas. It is not recommended for lentils and split peas. Salt and acid ingredients (tomato, vinegar, lemon juice) are added at the end of cooking time, as they harden dried legumes and extend their cooking time. If more water needs to be added during cooking, add boiled water as cold water further delays cooking. Do not cook two verities of legumes at the same time, even if they require same cooking time; they will cook rarely evenly. Cook separately. Fresh beans are more often eaten cooked than raw. They are served as a side dish or used in salads, soups, stews, marinades and stir-fries. They are delicious as a gratin or dressed with sauce or vinaigrette. They work well with tomatoes, thyme, oregano, rosemary, mint, marjoram, mustard, anise, nutmeg, and cardamom. Dried beans are eaten hot or cold, whole or pureed, used in soups, salads, sandwich spreads, and main dishes. They are also cooked as a dessert. Dried bean puree can be served as a side dish or used as a base for croquettes, or patties. Most legumes contain anti-nutritional substances like phytates, oxalates, gliadin etc; but cooking eliminates most of them. Remove the outer skin of dried legumes before eating. Do not use the soaking water for cooking. Chew well and avoid finishing the meal with a sweet dessert. (Medical disclaimer). <<-Back to Home page from Legumes.